No Car Required: Four Adventurous Weekend Escapes in Northern California along the Capitol Corridor - Get on Board! Long known as a convenient alternative to Northern California’s traffic-clogged roads, the 170 mile Capitol Corridor train route between Auburn/Sacramento and San Jose is also a great way for adventure junkies or those seeking a relaxing weekend getaway to hit the hills or the coast. Instead of creeping along in weekend traffic, you’ll be able to relax in a comfortable seat and read a book, chat with your companions, or simply enjoy the beautiful passing landscape. You can even bring your bike on board the Capitol Corridor for more thrills upon arrival. The Capitol Corridor has 17 stations along its train route, as well as a comprehensive network of dedicated, connecting bus lines that expands your choice of destinations. The best part is that buses are booked seamlessly with the train so when you plan your trip, both train and bus reservations are on the same ticket. And, once you reach your destination, it’s easy to grab an Uber or Lyft, hop in a taxi, rent a car, or use other public transit connections to get to where you need to be. After all, the journey is all a part of the adventure! Check out these four fabulous northern California destinations—Lake Tahoe, Monterey, Santa Cruz, and San Luis Obispo—all easily accessed with connections from the Capitol Corridor train/bus service. Enjoy stunning lake views during your time in Tahoe. Photo by Jim G.
Straddling the California-Nevada state line, Lake Tahoe is an adventure lover’s paradise. Capitol Corridor serves Truckee in North Lake Tahoe, as well as South Lake Tahoe. Tahoe Truckee Area Regional Transit offers additional north shore transportation, while the Tahoe Transportation District covers the south shore, so you can easily get around once you are there. The area boasts plenty to do year-round, and with lots of snow blanketing the Sierra this year, Lake Tahoe is a true winter wonderland. Some of the larger ski resorts are easy to access via Capitol Corridor bus stops, including ski shuttles to Heavenly Ski Resort in South Lake Tahoe and Northstar and Squaw Valley/Alpine Meadows near Truckee. Whether you’re staying at a romantic bed and breakfast, luxury resort, or cozy cabin, you can enjoy apres-ski fun in the evenings after a day on the slopes. If skiing isn’t your thing, take in Lake Tahoe’s natural beauty by snowshoeing on one of the region’s many trails, or enjoy an adrenaline rush by booking a snowmobiling tour with Lake Tahoe Snowmobiling. Donner Memorial State Park is only a couple of miles from the Truckee Depot, and features a fascinating museum showcasing the history of westward expansion into the Sierra, including stories of the ill-fated Donner Party and construction of the Transcontinental Railroad. Open year-round, you can cross-country ski or go snowshoeing there in the winter, and in the summer, it’s a great spot to camp, picnic, hike, waterski, fish, and hike. At Lake Tahoe, summer is prime time for hiking, biking, water sports, and the popular Truckee Thursday street festival. Don’t miss the Mt. Tallac Trail, which features gorgeous views of Lake Tahoe along with plenty of time in the forest. This nine-mile hike includes 3,300 feet of elevation gain; the upper reaches of the trail are near 10,000 feet, so it’s not for the feint of heart. 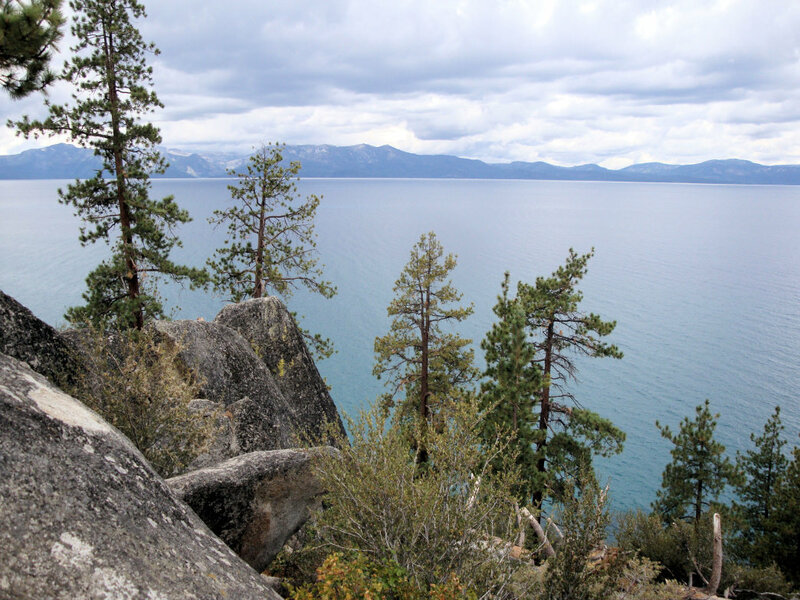 The Tahoe Rim Trail is another favorite among adventurous hikers. Bikers will love the plethora of options at Lake Tahoe, from challenging downhill routes like Saxon Creek Trail, also known as Mr. Toads Wild Ride, to the 72-mile loop around the lake popular with road bikers. No trip to Lake Tahoe is complete without getting out on the water. You’ll find all the water sports you could dream of on this pristine beauty of a lake. Try water skiing, wakeboarding, paddleboarding, fishing, kayaking, or swimming. You can even take a sunset cruise on board a historic paddle wheeler, the Tahoe Gal, which departs from Tahoe City. While at the lake, stop by Vikingsholm, known as “Tahoe’s Hidden Castle.” This stunning architectural wonder is nestled in Emerald Bay. To reach Vikingsholm, take the public bus to the parking area and from there, it’s a steep one-mile uphill trek to reach the house, where tours are available. In the summer, you can also paddle along the lakeshore to reach this scenic treasure. 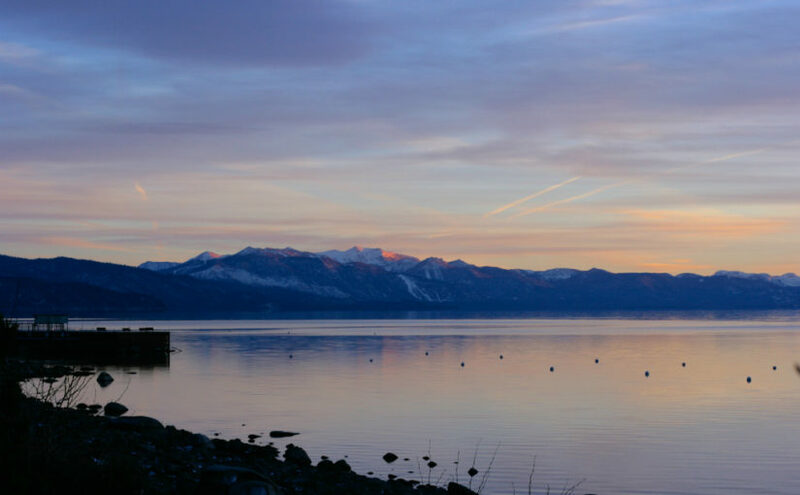 Getting to Lake Tahoe: You can take the train from any of the 17 Capitol Corridor stations to Sacramento where you’ll connect to a dedicated bus to either Truckee in North Lake Tahoe or South Lake Tahoe. There are three train/bus trips a day from the Bay Area to North Lake Tahoe, and one daily to South Lake Tahoe. 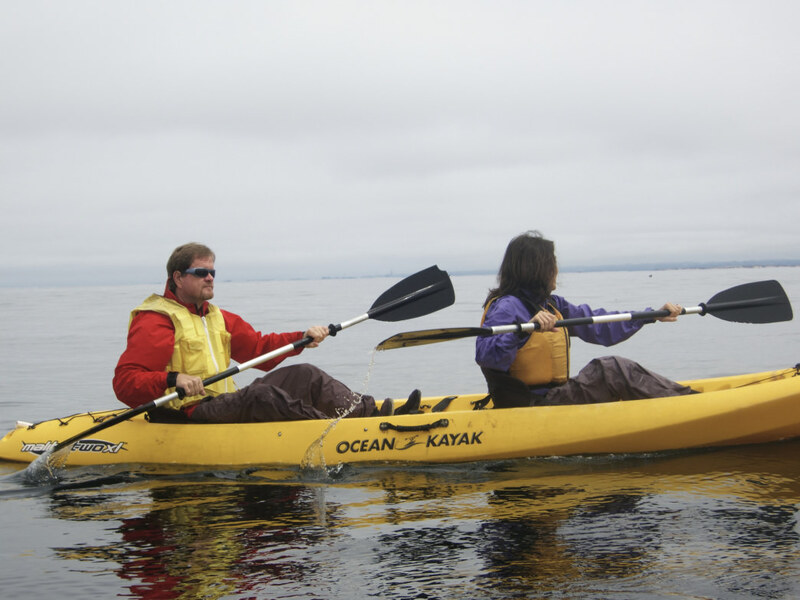 Take to the water and go kayaking in Monterey Bay. Photo by Timothy J.
Monterey’s seaside location makes it a water-lover’s dream. One of the best ways to fully experience the natural beauty is to head out kayaking or paddle-boarding in the pristine, biologically-abundant Monterey Bay National Marine Sanctuary or nearby Elkhorn Slough. You won’t need to be out on the water for long before spotting plenty of playful otters, seals, pelicans, and other marine life (while keeping a respectful, legally-required distance of 100 feet from the sensitive, wild animals). Numerous beachside outfitters can set you up with gear, guides, or anything else you’ll need to enjoy paddling in the area. Don’t miss the world-renowned Monterey Bay Aquarium, where you can get awe-inspiring, up-close looks at all the aquatic critters you could ever dream up. For a relaxing day, stroll along Cannery Row or take in the Monterey Museum of Art. Have a bowl of clam chowder at Fisherman’s Wharf, and consider staying at the LEED- certified Portola Hotel & Spa or Monterey Marriott located right by the wharf for convenient exploring. There are also many ways to explore Monterey on your feet, including a variety of great hikes in the area. Andrew Molera State Park boasts over 20 miles of trails, and nearby Pinnacles National Park is one of the nation’s newest national treasures ripe for exploration. If you would prefer a run, Asilomar State Beach offers great opportunities to go jogging along the trails. The boardwalk at neighboring Asilomar Dunes National Preserve is a great spot to explore the fascinating and crucial coastal ecosystem. Getting there: Take the train to the San Jose Diridon Station, then take the dedicated connecting bus to the Monterey Transit Plaza Bus Stop (MRY). Once there, Monterey-Salinas Transit, as well as the free downtown trolley, provide bus service to many of the local area destinations. 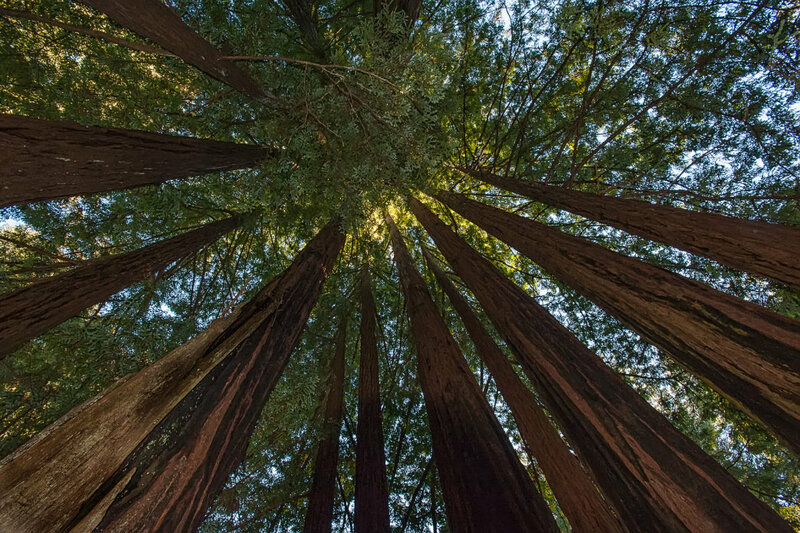 Hike among redwoods in Santa Cruz. Photo by Anita Ritenour. Hike among towering redwoods and then head to the beach in stunning Santa Cruz. For hiking right near town, head over to Pogonip Park’s 640 acres of redwood forest. This city park is adjacent to the UC Santa Cruz campus and offers eight miles of trails. After exploring this gem, head over to Henry Cowell Redwoods State Park and explore the 35 miles of trails on 4,650 acres. The coastal adventures don’t end there. The Skyline to the Sea Trail is a 31-mile wonder and a definite must-add to any bucket list. Take in all the amazing, old-growth redwood forests over this three-day backpacking trip. Next, rent a kayak or stand-up paddleboard to get out on the Santa Cruz Harbor. Take in the Santa Cruz Boardwalk from the water or wander this classic attraction on foot enjoying the beach and amusement park all at once. Getting there: Take the Highway 17 Express from San Jose to Santa Cruz. Seven buses a day transport people between the San Jose Station and the Santa Cruz Metro Center. The trip length varies slightly depending on the time of day, but usually takes about an hour. Once in Santa Cruz you can take Santa Cruz Metro to get around the city and, during the summer, there is also a trolley that runs from downtown to the beaches—it’s only 25 cents per ride. The countryside of San Luis Obispo. Photo courtesy of mdot. This friendly college town is more than just a place to hit the books. It’s also full of adventure and offers visitors great hiking, biking, and more. You might even take a stroll through the infamous and somewhat-icky Bubblegum Alley for a peek at an alley packed with, you guessed it, chewed bubble gum. For a less stomach-churning option, hike up Bishop Peak, a four-mile out-and-back route that has over 1,000 feet of elevation gain. It’s the tallest of the “Nine Sisters” and offers great wildflowers and views. The Valencia Peak Trail is another popular option with a little over three out-and-back miles to enjoy and a 1,100-foot climb. Experienced bikers will enjoy the century tour to Santa Barbara. This 100-mile route involves stunning scenery and an option to take the train one way and ride the other. Check out the campus at Cal Poly and don’t forget the Mission San Luis Obispo de Tolosa. Also be sure to stroll the San Luis Obispo Botanical Garden in El Chorro Regional Park. Getting there: Take the Capitol Corridor to the San Jose/Diridon Station. 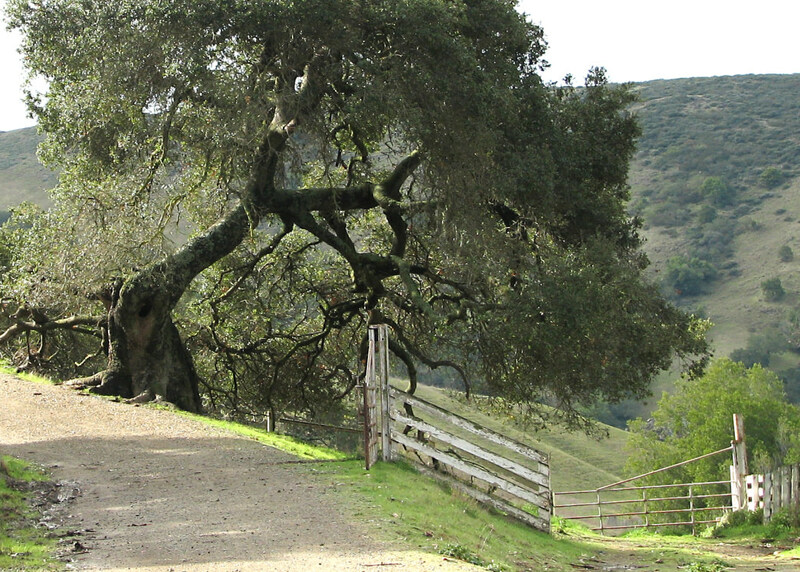 Then take the connecting bus (San Jose to Santa Barbara route) for a relaxing, four-hour ride to San Luis Obispo. Once there, you can walk, hop on a public bus, or take a trolley around the city. Featured image provided by Miguel Vieira.